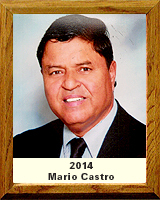 Mario Castro was born in Nogales, Sonora on August 14, 1948 and is one of eighteen children. He spent his childhood helping his family by hustling up and down the streets of Nogales, Arizona selling the Nogales Daily Herald. This experience provided him his first glimpse into the joys of running. Castro moved with his family from Nogales to Tucson in 1961 and after a short stint at Wakefield Jr. High, Mario enrolled in the Sunnyside Unified School District. There, Jim Mielke and Carl Brunenkant, helped nurture his talent as a runner. During his sophomore campaign at Sunnyside High School he placed 2nd Overall in the state cross-country meet and qualified for the state track meet by running a 4:35 mile. During his junior year (1966), Castro went undefeated during the regular season and capped it off with Sunnyside’s first cross-country individual and team State Championships. He went on to repeat as State Champion in 1967 and qualified for the state track and field meet by running a 4:23 mile. Castro was honored in several ways for his accomplishments. This included earning a spot in Sports Illustrated’s “Faces in the Crowd” (1-16-67). Castro earned a scholarship to the University of Arizona where he lettered all four years in both Cross-Country and Track and Field. He placed in the top ten every year in the WAC Conference meet. He graduated with a B.S. (1972-Physical Education) and earned a M.A. (1976-Administration). Castro taught and coached for TUSD for 32 years. As he started his coaching career in the 70’s, at Pueblo High School, he was part of a track dynasty coaching with Clay Hitchcock and Curly Santa Cruz. He was part of Pueblo’s boys track 2nd place finish at the state meet in 1975. He was part of Pueblo’s girls track state championship in 1977. His cross country teams placed in the top five in the state from 1973 to 1980. Many of his athletes received college scholarships. He was named coach of the year in 1972 and 1974. He was also an assistant track coach (1990-2000) under Jim Mielke at Pima CC. Many of his athletes qualified for national meets, some earning all-american recognition. Castro received a Copper Letter from Tucson Mayor Lew Murphy, for recognition of his outstanding coaching accomplishment for his team winning the 1973 Cross County City Championship. He was a charter member of the committee for the Mezquite Cross Country race, which began in 1993. He was also the starter of the meet every year. In 2005, Castro was inducted into Sunnyside High School’s Hall of Fame and has been recognized for his accomplishments by having an annual track meet named in his honor: Mario Castro Track and Field Invitational. Sunnyside Unified School District also inducted him into their Hall of Fame in 2006. Castro has been married 41 years and has a daughter and son, both graduates of Carleton College in Minnesota. Brenda is a City of Tucson detective and Mario is an administrator at Sunnyside Unified School District.